ACCRA, Ghana, -/African Media Agency (AMA)/- The African Transformation Forum (ATF), held from 14-15th March in Kigali, Rwanda, concluded with the official launch of The Coalition for Transformation in Africa – a network of experts working across sectors and borders to drive policy and institutional reforms. Earlier, the ATF welcomed HE Paul Kagame, President of the Republic of Rwanda, who gave a detailed speech about how his small nation has led the way in forging a developmental state based around a strong economy and widespread participation from citizens. The Forum also held interactive discussions on the continent's vital sectors and ambitions – among them agriculture, trade and financial inclusion. Dede Amanor Wilks, a development specialist currently consulting with the UN's Economic Commission for Africa (ECA), was applauded for a strong speech arguing that women hold the key to a green revolution in Africa. Wilks argued that "economic transformation begins with agricultural transformation" for Africa's women. Far more must be done by governments to better the lot of their female citizens if they want to encourage the broad-based transformation of rural communities, she urged. "The greatest obstacle to the role women can play in transforming African agriculture lies in political will," she said. "Women's cooperative movements can change the balance between men and women in agriculture. Cooperative societies can provide an institutional framework for women to solve many of their problems." "We were not looking at agriculture through the right lens. We were looking at agriculture as a developmental activity, like a social sector in which you manage poor people in rural areas. But agriculture is not a social sector. Agriculture is a business. Seed is a business, fertilizer is a business, storage, value added, logistics and transport – it is all about business." Enabling greater business participation was very much on the agenda during a passionate discussion on broadening citizens' access to financial services. 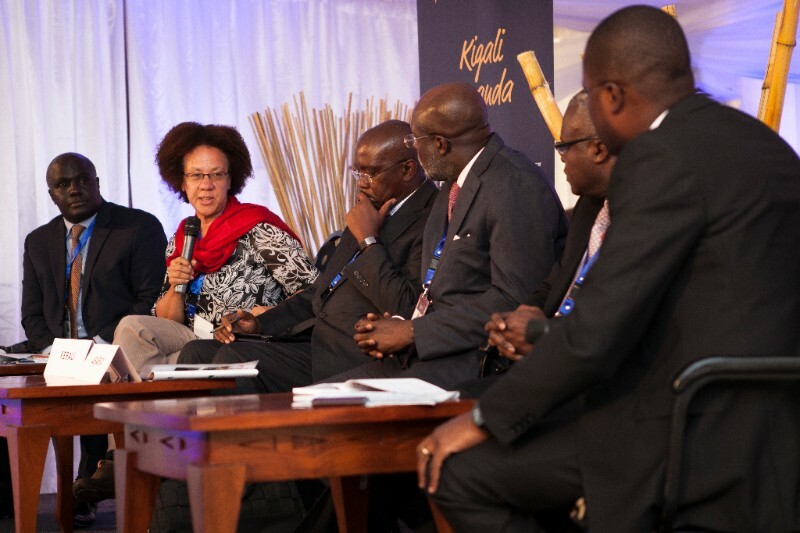 Panellists argued that Africa's financial system must reach out to rural citizens if the continent's economic transformation is to be truly inclusive. The speakers – among them Thomas Kigabo from the Central Bank of Rwanda, Amolo Ng'weno from the Bankable Frontiers Associates, and Henry Kerali, Country Director for Ghana, Liberia and Sierra Leone at the World Bank – debated how financial firms can reach small and medium enterprises in rural areas. Away from the formal financial sector, crowd sourcing schemes should be piloted to raise money for SMEs that wish to expand by drawing on Africa's keen diaspora. Speaking on a panel covering trade and regional integration, Richard Sezibera, Secretary General of the East African Community, argued that "trade facilitation should be anchored into economic transformation." Africa's domestic markets are simply too tiny to enable the local industry to achieve economies of scale. The continent has by far the lowest level of inter-regional trade, of any other region, at less than 13%, while the cost of trade among African countries is higher than the cost of trade with nations outside the region. According to Sezibera, a lot of work has gone into implementing policies for intra-ECA trade. In Rwanda's case it has grown from 10% to 26% in less than a decade – which is fast but not fast enough. Despite an intense focus on tariffs in existing debates, Richard Newfarmer, country representative at the International Growth Centre, argued that the real issue is the "nitty gritty barriers to intra-regional trade"
Distributed by African Media Agency (AMA) on behalf of IC Publications.